Hi Everyone Dee here I hope you are all well and getting ready to go off on holiday or have been if you are lucky enough. 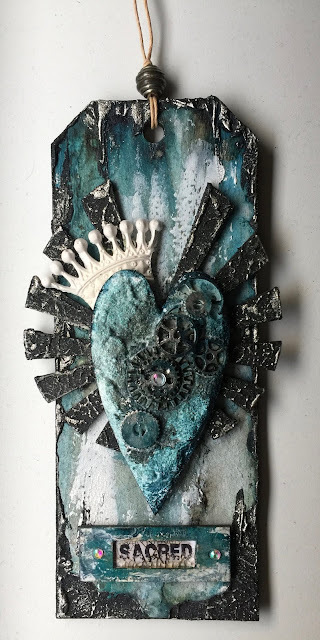 My post today has been created using using Andy's fabulous Eldaro chipboard set, some amazing Deco Art products, Illusionary artist stamps and a few clay pieces + 1 or 2 maybe 3 gems. around the edges of the whole tag. For the heart I used snow tex and sprinkled it with a bit of glitter then pressed my little clay cogs into the wet paste. I only used the small set of wings as I wanted to keep it contained to the main tag. I used the Ferro on the wings the same way as I did on the base of the tag. attach the centre gem and the heart is finished. The main tag was coloured by dripping and spraying with water then once happy I applied a tiny bit of Deco Art crackle paint. For the plaque I used the same colours for the base tag but applied them with my finger. I stamped the word sacred from Andy's word plate using archival ink. I gave it a coat of Decoupage glue then applied crackle glaze and allowed to dry. once cracked I used brown antiquing cream to highlight the cracks. I hope you have all enjoyed my project and it has inspired you to get into your craft room and start crafting away. Andy skinner word up and numbers stamp.